I’m hanging out with friends for an impromptu Sunday Funday and wanted to bring along something sweet… and chocolatey. 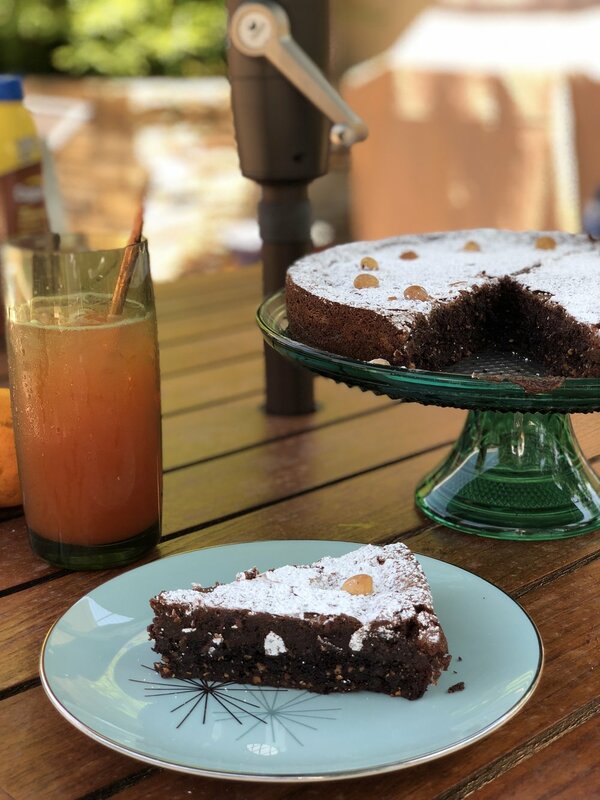 A quick scan of my pantry zeroed in on three of my favorite ingredients: Semi-Sweet Chocolate, hazelnuts, and an orange liqueur that I love… Cointreau! Combine those three ingredients with a big help from my Double Chocolate Brownie Mix, and new special dessert has come to life! It is a decadent amount of chocolate, the flavor and texture from roasted hazelnuts, and a slight hint of orange which pairs perfectly with rich dark chocolate. Look out, Ina Garten… Something fabulous is hitting the web! My Double Chocolate Brownie Mix and Roasted Ground Hazelnuts... Heaven! Preheat your oven to 350 degrees. Lightly spray the bottom and inside of a 9” springform (cheesecake) pan. In a mixing bowl add the In The Kitchen With Scotty “Double Chocolate Brownie Mix”. To that add the melted butter, extracts, and beaten egg. Mix until combined. Next, add the roasted ground hazelnut * and fold in. The dough will seem stiff, and that is okay. It will be the base/ “crust” of this torte. Press the hazelnut brownie dough into the bottom of your prepared springform pan, making sure it is even and the dough reached to the sides of the pan. Place the pan into the oven and bake for 25 minutes. Remove from the oven and cool while you make the filling. While the brownie base is baking start working on the filling. In a double boiler add both chocolates, brown sugar, and butter to the bowl or top portion of your double boiler. (If you do not have a double boiler you can create one by fitting a metal bowl on top of a pot of simmering water.) Mix the butter chocolate and sugar together until everything is melted and smooth. Remove the top portion form the double boiler to cool, 15 minutes. One at a time and whisking quickly, add each egg. When one has been mixed in thoroughly add the next egg and repeat until all of the eggs have been added. Add the orange zest, the Cointreau liqueur, salt, and flour. Gently mix in until thoroughly mixed in. Pour the batter into the springform pan on top of your brownie base. Gently tap the pan on the counter to release any trapped air bubbles. Place into the oven and bake 30-35 minutes or until the center is just set (slight “jiggle” in the center). Remove from the oven and cool. Once cooled place in the fridge to finish setting up at least 3 hours or overnight. This is basically a “truffle/ganache like” filling on a chewy brownie crust. You will want it chilled before slicing. Dust the top with powdered sugar and extra hazelnuts you may have. Enjoy! 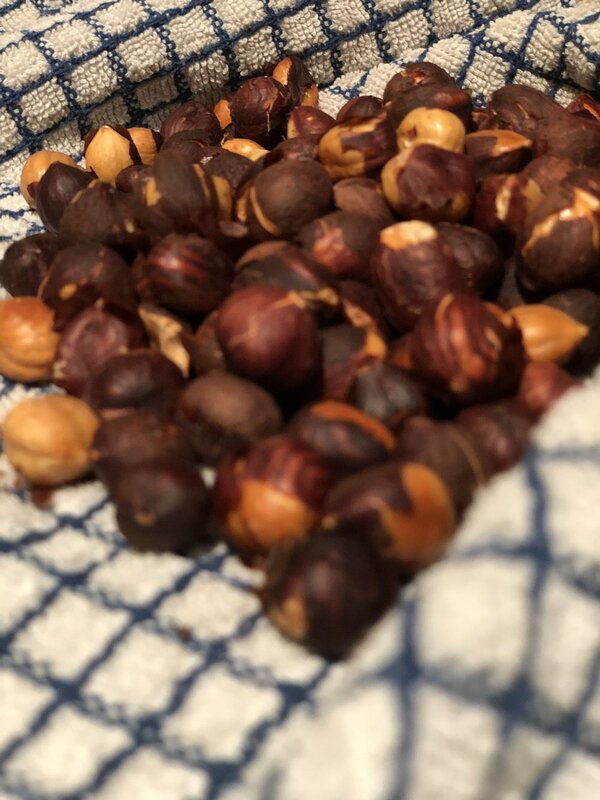 *To Roast and Peel Hazelnuts: Preheat your oven to 350 degrees. Place the hazelnuts on a small sheet pan or dish. Roast the nuts until fragrant and golden brown. Remove from the oven and pour the nuts out onto the center of a dish towel. Ball up the towel like a sachel, twisting the top firmly. With the palm of your hand cupping the ball end of the sachel, rub the hazelnuts together... this helps to peel the papery skin away from the hazelnuts. 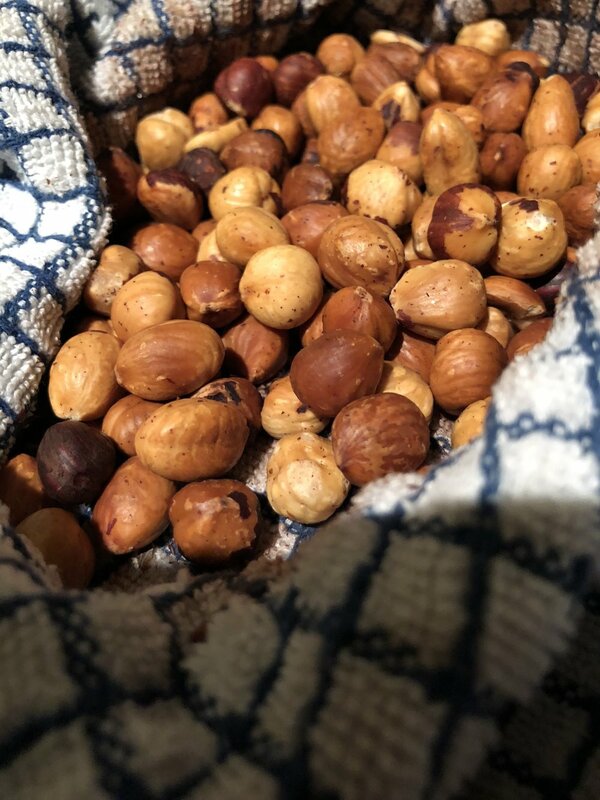 Open the sachel and pick away the perfect peeled hazelnuts. Repeat the process again if necessary.